St. Bernards will need a lot of protein and carbohydrates for all-day energy and to maintain muscle mass. Even though they’re large and considered working dogs, they don’t expend a lot of energy, preferring to move when they’re required to instead of jumping around all day. Their large frame causes them to want to save their efforts until it’s necessary. Who doesn’t love a giant St. Bernard? From movies to books to advertisements, that gentle yet strong face has our complete attention. And if you decide to bring one into your home? There’s a lot you need to know. Giant dog breeds have specific health concerns you need to look out for. Plus, your St. Bernard will need joint and coat support throughout its life along with careful attention to weight. These famously patient dogs are great with kids and families and mostly love laying around getting cuddles. Let’s take a look at what your St. Bernard needs to stay happy and healthy. Food should be nutrient dense so that your St. Bernard gets all the building blocks for health without adding a bunch of empty calories. Giant breeds are susceptible to weight gain and subsequent issues with joints and bones, so it’s critical that your food be high quality to maintain that delicate balance. St. Bernards are a pretty sturdy breed, but they do have some potential health issues to watch out for. Some of these can be managed or avoided altogether with the right diet, so let’s take a look at what you should be watching for. Large breed dogs frequently fall prey to this condition that affects the hip socket. St. Bernards are no different. While it’s determined by genetics, there are some things you can do to help your St. Bernard avoid the worst. Food formulas that contain glucosamine and chondroitin help support joint health and maintain the cushioning between the ball and socket. Also, foods that help control weight (especially as a growing puppy) prevent extra stress that can cause it to pop out. Other factors could include additional, complete proteins to improve muscle mass, which supports the surrounding joint. St. Bernards are susceptible to extra weight, which stresses their bone structure. Foods must contain a dense amount of nutrients to provide the levels of protein needed without adding additional fillers that can pack on the pounds. Giant breed dogs that begin to gain weight have a lot of trouble losing it because the weight causes pain in bone structures and muscles. Keeping weight to ideal proportions affects the entire quality of life for your St. Bernard. Large breed dogs with large chest cavities are also prone to a life-threatening condition called Bloat. The stomach begins to distend and twists causing death if not treated immediately. St. Bernards should get food that’s nutrient dense to support having multiple smaller meals during the day which can help stave off bloat. Make sure you know the signs of bloat so you can seek emergency treatment immediately. St. Bernards need high-quality whole proteins to support their massive frame and muscle tone. Proteins should come from whole sources like deboned chicken or salmon and never from by-product meals. These proteins are the basic building blocks of your St. Bernard’s health and well being. A balance of complex carbohydrates and fiber can also help maintain your St. Bernard’s health. Slow release carbs are critical to maintain energy levels throughout the day without spiking blood sugar. Fiber helps maintain proper weight and help improve overall digestion by providing valuable prebiotics. Round things out with whole fruits and veggies for antioxidants and vitamins plus glucosamine and chondroitin for joint health. The addition of probiotics improves overall digestion and immune functions while omega fatty acids help keep skin and coat healthy. Corn and soy are two cheap fillers companies frequently use to bring down the overall cost of the food but buying these types of foods is a mistake. These fillers are frequent offenders for allergic reactions, and all they can offer your pet is empty calories. It’s nearly impossible to control weight and provide complete nutrition when these two are listed first on the ingredients list. Poultry by-product meals are cheap sources of protein that can also cause allergic reactions and don’t contain all the building blocks necessary for healthy muscle growth. Combined with empty fillers, you’re still offering mostly empty calories with very little nutrition. One development in dog food that’s happened recently is the concern over using potatoes, peas, and legumes in foods. These ingredients recently showed a possible connection to Canine Dilated Cardiomyopathy or a condition of an enlarged heart. Since St. Bernards are already susceptible to enlarged hearts, we recommend that you avoid foods these ingredients listed in the first three positions on the list. There are a few brands that are all over store shelves but are some of the worst offenders for adding the ingredients we mentioned to avoid. 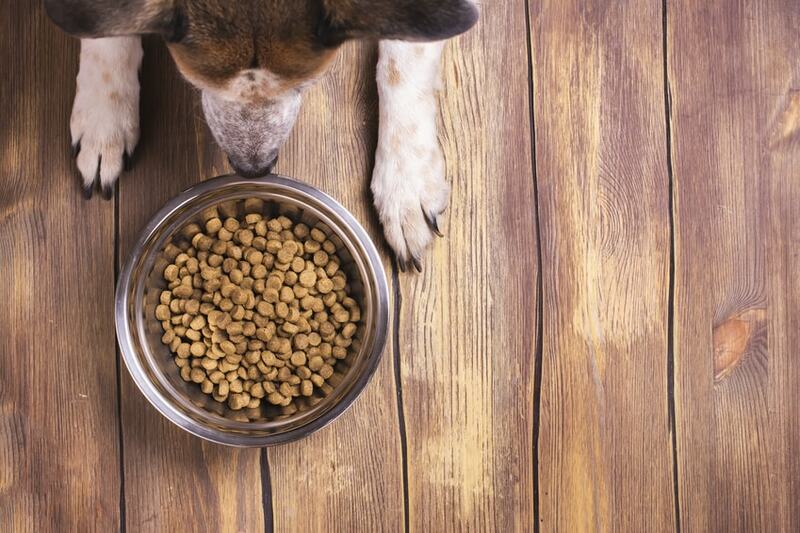 If you want to feed your dog the best nutrition, we recommend avoiding these foods no matter how much the price tag calls your name from the shelf. Kibbles N Bits: Classic brand with little real nutrition. It uses corn and soy fillers, chicken by-product meals, and artificial flavors and colors in most of its formulations. It’s cheap, and that’s where the benefit ends. Ol Roy: A Walmart brand known for coming in giant bags with tiny price tags, cheap is about the only thing you’ll like. It also uses corn and soy products and lacks complete proteins necessary for good health. It can also cause digestive issues from improper fiber contents. Purina Beneful: Beneful looks nutritious, but you could do a lot better than some of the formulas in this line. They use some cheap fillers and multiple sources of incomplete proteins and by-product meals in many of their recipes. Plus, some pets have had digestive issues consuming this food on a regular basis. St. Bernards are going to consume a lot of calories during the day just because of their large size. While they aren’t going to eat endlessly, you should work with your veterinarian to determine the exact feeding schedule and portion size for your specific St. Bernard. Puppies: It’s critical that you carefully control the growth of St. Bernard puppies to avoid stressing joints and bones. Your vet may change feeding recommendations rapidly within the first few months to account for that quick maturation. Use a large breed specific food here. Adults: Healthy adults range in size from 120 to 180 pounds. They’re typically low energy, so they won’t eat much more than a large breed dog, two to four cups on average spaced out over several meals. Seniors: Maintaining weight becomes critical here, so seniors may see a slight reduction in servings. Work with your vet to establish the right diet plan for your aging companion. Feeding your St. Bernard the right food doesn’t have to be difficult. Check ingredients for the first five on the list and make sure it includes protein from a whole source plus a complex carbohydrate for energy levels. Other supplements for joint and coat health are also critical for this breed. Merrick’s formula uses a blend of premium kibble and freeze-dried bits of raw meat to create a recipe that’s enticing and contains plenty of whole proteins. It blends complex carbohydrates and good fiber content to help manage your St. Bernard’s weight. Plus, fruits and veggies provide antioxidant support while glucosamine and chondroitin support joint health. Essential fatty acids help keep that long coat healthy and supple. Merrick creates quality foods right in the company’s own test kitchen, giving your dog complete dense nutrition without no fillers or artificial colors and flavors. Merrick is manufactured and based in the United States and wants to provide simple meals with high-quality ingredients. Nutro’s Wholesome Essentials is formulated to provide your St. Bernard with all the building blocks for health at a more affordable price. It features whole proteins from lamb with healthy brown rice to provide carbs and fiber for energy and digestion. It has joint support supplements and essential fatty acids for skin and coat health. Plus, there are no cheap fillers often found in other budget foods. Nutro got started from a desire to create wholesome meals that could help the creator’s dog keep up with his athletic lifestyle. It takes inspiration from what makes athletes strong and healthy and applies that to sound nutrition for your large breed dog. Ollie uses human grade ingredients to create their cooked meals, giving you a third option between kibble and a completely raw diet. The portions arrive at your door fresh and ready to serve or store in the fridge. Whole deboned turkey provides the bulk of protein requirements while veggies and fruits offer antioxidant and vitamins. Fatty acids ensure skin health and calcium keeps bones strong. Ollie uses vet recommend nutritional guidelines to give you a balance between kibble and raw diets. Cooked meals arrive at your doorstep in easy portion sizes and everything can be customized through your online portal. It’s crucial that you control your puppy’s growth. Rapid growth in large breeds leads to serious musculoskeletal issues later in life. Puppy foods should be formulated for large breeds to account for this. Instinct By Nature’s Variety uses bits of freeze-dried raw meat along with premium kibbles to make food that encourages your puppy to eat. It has whole sources of protein with no grains that can accelerate growth. The formula considers your growing large breed puppy’s unique needs with joint and bone support, proper vitamins, and antioxidants to boost the immune system. Instinct By Nature’s Variety’s primary mission is to provide the proper nutrition based on your dog’s ancestral diet. The company offers only premium ingredients with whole sources of protein so that your large breed puppy grows appropriately and has all the beginning building blocks to a lifetime of health. If your puppy isn’t ready for full dry food, or you’re feeding half and half, Nutro’s canned formula is a way to feed your puppy a wet food without sacrificing a large breed specific formula. Despite the rich, premium ingredients, the formula still considers how to carefully control your puppy’s growth through a proper balance of whole proteins, complex carbohydrates, joint support supplements, and fatty acids for brain and skin health. Nutro understands your large breed puppy’s needs and produces formulas that balance nutritional needs with controlling growth. The company provides a range of recipes for a lifetime of health with only premium ingredients and no cheap fillers or artificial flavoring. The most significant factor in feeding your senior will be supporting joint health and maintaining a healthy weight. Foods should consider the weight of your giant breed and offer complete dense nutrition with weight support. Now Fresh is a large breed specific and weight control formula in one. As your St. Bernard ages, Now Fresh’s whole proteins and carefully controlled carbs help keep weight under control even with reduced activity levels. It contains joint support with glucosamine and chondroitin from natural New Zealand mussel sources, plus added probiotics and antioxidants to ease the aging process. Now Fresh uses premium ingredients to help ease the aging process for your senior large breed dog. The company focuses on perfectly blended formulas that consider both the size and life stage, so you never have to decide between two different foods for two different situations. Life Protection formulas contain Blue Buffalo’s proprietary mix of antioxidants and vitamins in convenient little bites that add texture. It includes proteins from whole deboned chicken, plus slow release complex carbohydrates in the form of brown rice, which helps manage weight. LifeSource bits contain vitamins and antioxidants necessary for immune system support, glucosamine and chondroitin protect joints, and fatty acids keep the skin healthy. Blue Buffalo’s story started with an Airedale Terrier named Blue and one family’s journey to find the best food available. The company uses premium ingredients for high-quality kibble explicitly designed for your dog’s life stage and body type. Your sweet St. Bernard is a loving part of the family, so make sure it lives its best life from puppyhood to the golden years. Foods should consider your giant breed’s unique needs and help keep weight under control so that joints and bones are protected. Your St. Bernard wants nothing more than to keep watch over your family so make sure to give your giant companion the right nutrition to support all that love.